Release Khadijeh Moghadam and Mahbubeh Karami the two women rights advocates! While 10 out of 12 women's rights advocate are released, but two high profile women activists are still in Evin prison. International campaign for Human Rights in Iran demanded for the release of Ms. Khadijeh Moghadam and Ms. Mahbubeh Karami. The campaign believe, there is no legal explanation for this arrest. The judiciary power officials without any explanation didn't accept the bail of Khadijeh Moghadam and Mahbubeh Karami .The 10 women rights advocate were released on $ 50,000 each and was asked to attend in the office of prosecutor on Sunday April 4, 2009 . 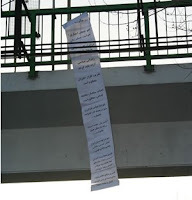 A letter from Mr. Brujerdi an imprisoned Iranian clergy to Mr. Hashemi Shahrudi the head of Islamic Republic Judiciary power! It is now 30 months that I am in prison and have been from prison to prison and ward to ward in Tehran and Yazd city and have becom really ill and unhealthy. I was six months in solitary confinement in cell 209 with mental and physical burden. Now, for the last time ,i would like to speak to you that during this three years that i was the hostage , i have becom ill , old and unable and feel the death every day. wishing that freedom , independent and democracy rule . 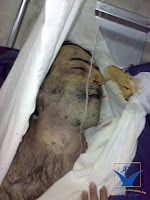 New information about the death of young Iranian blogger Mr. Omid Reza Mirsayafi in Evin prison! IRAN WATCH CANADA is not recomending you to see this picture. Reporters Without Borders ( RSF) called the death of Mirsayafi " murder" and demanded for an independent commission to investigate how he have died in Evin prison. Omidreza Mirsayafi was summoned on February 7,2009 to Tehran court of revolution and was arrested and detained, and on Wednesday March 18 , 2009 he lost his life in Evin prison. The prison officials announced he commited suicide inside the prison and was transfered to Loghmanodoleh hospital but pronounced death. This is the picture of Late Mirsayafi when his dead body was handed to his family for burial . His dead body is currently in croners office for autopsy . The family of this recent victim is going to call all possible officials to follow up his suspicious death in Evin prison. "According to "Human Rights Activist in Iran" at the time when his lifeless body was handed to his family, there were evidence of bleeding from his left ear , nose, back of his head, and there were dark -blue areas at the back of his body which increases the complexity about his death." Student's rights advocate and women's rights advocate must be all released from prison! Shirin Ebadi about the arrest of women's rights advocate : There has been violation in all the process of these arrest. There has been news today that, these women's rights advocate has been released. But , the regime didn't releas all, some are still in prison including the men who have supported the women cause. Intense torture of an Azarbayejani activist ! Mr. Ramin Sadeghi is under intense pressure in detention centre of the Ministry of Information office in "Ardebil" city. Reliable sources have reported that: " Mr. Ramin Sadeghi Asl" one of civil rights activist of Azarbayejan in the city of Ardebil was arrested in his parent home on Feb. 5,2009 and upto now he is under intense torture and worse condition in detention centre of the Ministry of Information office in Ardebil city." Mr. Mohammad Sadeghi the brother of this Azarbayejani activist after spending 17 days temporary imprisonment was released on a 30, 000,000 Tuman ( almost $30,000) bail on March 14,2009. Earlier Mr. Ebrahim Sadeghi younger brother of both Ramin and Mohammad after spending two weeks in prison was released. Meanwhile, according to a prisoner who was released recently from detention centre of the Ministry of Information office in Ardebil city told that; the agents have tortured Ramin and his brother Mohammad in a frightening way. The interrogators have hanged them on one foot for several days and tortured them with a machine called " charkhe Falak" (merry- go round).
" Giving electric shock to sexual organ and other sensitive parts of the body , severe beating , lashing by cable, solitary confinement, keeping the prisoner awake at sleeping time and insulting and humiliating " are the tactics the interrogators use to take false confession from prisoners. According to this reliable source , Sadeghi brothers under these severe physical and mental tortures were forced to say what they haven't done. 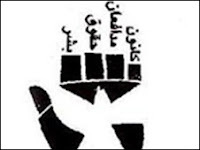 They have signed a confession which shows , together with three other Azarbayejani activists in "Moghan" ,they passed Aras river ( A border river between Iran and Republic of Azarbayjan ) and had close contact with foreign mercenaries in order to receive guidance for distribution of CD's and pamphlets in general to execute the movement of Azarbayjan. They were also forced on false confession about other Azarbayejani activist including Mr. Abbas Lesani and his wife. According to human rights defenders, it was agreed that Mr. Ramin Sadeghi would also be released before New Year ( Persian New Year, first day of spring , 20th of March) after the investigation by Ministry of Information.But when he attended the court in the city of Ardebil , he didn't approve the confession during interrogation which was added on his file. He announced " All these confession has been taken under intense physical and mental torture and has no validity." But Ardebil city prosecutor has ordered to return him to detention centre of the Ministry of Information office in "Ardebil" city for accepting the confession. Ramin and his two brothers while in detention were deprived of lawyer and meeting with their family . Mr. Ramin Sadeghi was arrested in the past on occassion such as " International Mother tongue Day(Feb. 20th) and was detained for a month and was released on bail.Amnesty International has called his case as prisoner of Conscience and demanded for his release. Join the international campaign and turn off your home light on Saturday March 28 @ 8:30 pm for one hour! 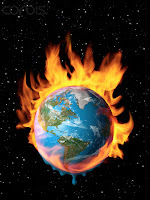 In support for the initiation to reduce global warming more than 500 city's from around the world are turning off their light on Saturday March 28, 2009 at 8:30 pm for one hour. The goal of the organizers is that 1000 city's from all over the world to join the campaign. On 2007 only Australia participated in the campaign and more than 2 millions home turned off their light . On Thursday more than 10 members of Campaign for One Million Signature and mother for peace has been arrested by Islamic Republic security agents ! They were on their way to the house of political prisoners family's including Zahra Baniyaghub's family ( the young medical student who have died mysteriousely in prison) to greet them for the New Year. They had agreed to meet in Sohrvardi St. at Seyed Khandan bridge in Tehran. They were arrested and were transferred to Nilufar police station. Environmental disaster along Persian Gulf !? Roxana Saberi has threatened to go on hunger strike, if not released! Roxana Saberi the Iranian -American journalist who is detained in Evin prison, in a telephone contact with her father said: "If they dont release me, I would go on hunger strike." Mr. Reza Saberi the father of Roxana in speaking with Ruiters news agency said: On Tuesday her daughter called him. He said: " I worry about her, she is very much intends to do suicide" . I tried to calm her down, i told her, we are trying all we can to gurantee her freedom and she is better to hold on". Roxana was reporting for foreign news agencies from Iran.She has been arrested for almost a month now and is detained in Evin prison where Zahra Kazemi the Iranian -Canadian photojournalist has died. 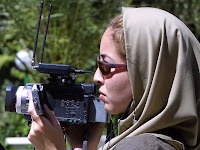 The Committee to Protect Journalists is alarmedby a news report indicating that Iranian-American journalist Roxana Saberimight remain in prison for a prolonged period. In a telephone conversationwith her father, Saberi said a prosecutor told her she would remain indetention for "months or even years," The New York Times reported today. "We are very deeply concerned by the circumstances of Roxana Saberi'sdetention," said CPJ Middle East and North Africa Program CoordinatorMohamed Abdel Dayem. "She continues to be held without charge, whileofficials have offered shifting reasons for her detention." Saberi was detained in January. Since then, Iranian officials have issuedconflicting explanations for the detention. Initially, Saberi told herfamily that she was apparently being held for buying wine. A few dayslater, a spokesman for Iran's Foreign Ministry stated that Saberi was detained for reporting without proper accreditation. The next day, aspokesman for the Iranian judiciary confirmed that she was being held inTehran's notorious Evin Prison, where political prisoners are frequentlyjailed. He added that she was being held in accordance with a writ issuedby the Revolutionary Court, but he would not reveal the reasons for thedetention. "We are particularly concerned about Saberi's physical and mental health,especially in light of where she is being held," CPJ's Abdel Dayem said. At least two journalists have died at the prison in last six years insituations that have not been fully explained. Omidreza Mirsayafi, anIranian blogger serving a 30-month sentence on a charge of insulting religious figures, died at Evin Prison last week under mysterious circumstances. In 2003, Iranian-Canadian photojournalist Zahra Kazemi died from a brain hemorrhage that resulted from a beating at Evin Prison. The information contained in this update is the sole responsibility of CPJ.In citing this material for broadcast or publication, please credit CPJ. Support Peace, Protection of Environment and Social justice! Mr. Hamid Mafi the past editor of " Farhang Ashti" ( culture of reconciliation) and "Hadis Ghazvin" newspaper is arrested by security agents. Mr. Mafi was arrested in his home 12 days ago, befor the Iranian New Year by security agents. There are no news on his whereabout and charges. His family members also have no news about him. Presidential election in Iran ! The presidential election will be held on June . The presidential candidates will start their campaign from Friday May 22,09 for 20 days. He said : There are 46 millions and two hundered thousands (46,200,000) Iranian eligible to vote. This coming election is the 10th presidential election in the Islamic Republic. Centre for Human Rights Defenders in Iran protested to the arrest of family members gathered in front of Evin prison. On Iranian New Years Day , families of the imprisoned students in Evin prison get together in front of the Evin prison to celeberate their New Year closer to their dear one, but several of these family members together with student activists were arrested by security agents and are detained. 4-Ms. Bahare Hedayat- Central council member of " Daftare Tahkime Vahdat"
5-Mr. Majid Dori - Student deprived from continuing his education in "Alameh University"
6-Mr. Said Faizollahzadeh- Deprived from continuing his education in " Alameh University"
8- Farid Hashemi -Central council member of " Tahkim Vahdat"
9- Amin Nazari - Central council member of " Tahkim Vahdat"
10- The security agents also in this event confiscated the plate number of Mr. Keyvan Samimi's car. Mr. Samimi is secretary of the "Committee Following up the Arbiterary Arrests". The security agents for dispersing the crowed in front of Evin prison used the tear gas. With best wishes for all of you. On Fri. March 20, 2009,at 03:14 PM Iranian all over the world will celeberate their New Year . , following the recent death of another prisoner of conscience, demonstrates that Iranian authorities are seriously neglecting the health of prisoners the International Campaign for Human Rights in Iran said today. The Campaign called on the Iranian Judiciary to immediately investigate and prosecute prison officials for their neglect and responsibility in these deaths. “Iranian leaders have relegated the administration of the prison system to a group of incompetent and cruel officials who are showing their utter disregard for human life,” said Hadi Ghaemi, the Campaign’s spokesperson. “If the authorities do not move quickly to hold negligent officials responsible, they are reinforcing impunity and the lack of accountability,” he added. On 18 March, 29-year-old blogger Alireza Mirsayafi died while in Tehran’s Evin prison. According to an account by Hesam Firoozi, a physician also imprisoned in Evin, Mirsayafi had taken extra doses of his medication. Firoozi’s account, as provided by the Human Rights Activists in Iran, notes that Mirsayafi suffered from serious depression. Firoozi was present during the initial stages of Mirsayafi’s treatment inside the prison’s medical clinic and reported that the prison doctors failed to provide proper care by not sending him immediately to a hospital to save his life. Mirsayafi’s lawyer, Mohammad Ali Dadkhah, told the Campaign that Mirsayafi’s sentenced was rushed into implementation without proper judicial procedures and that he had not been notified officially of the sentence before its implementation. “From the Judge who sentenced Mirsayafi solely for his peaceful opinions, to the prison medical staff who ignored his critical condition, a host of judiciary and prison officials are responsible for his death. Mirsayafi’s death is an indication of the cruelty of Iranian Intelligence and security agencies abusing the courts with the cooperation of the Judiciary,” Ghaemi said. For the latest human rights developments in Iran visit the Campaign’s website at http://click.icptrack.com/icp/relay.php? Iran student movement: Release our classmates NOW! Naser Zarafshan is banned to leav the country! Mr. Zarafshan is a member of "Iran writers Association" and " Iran Lawyers Society ". He is as well lawyer for the family's of the victims of "chain murdering" in 1988. Mr. Zarafshan was invited to European Parliament by the president of all Europe Green Party and coordinator between Iran & Europe of the European parliament.He was to participate and discuss on environmental issues in Iran and the future of the relation of Iran and Europe. Mr. Zarafshan in speaking with "Radio Farda" said: "He was banned to leave the country in Tehran airport" and his passport is taken away by security agents of Iran Government. Mr. Zarafshan said: After taking my passport, the agents gave me a letter and said, on May, meaning 10 months ago , i had a case file in court , and because of it , ican't leave the country." Mr. Zarafshan said : This is a pretext to take my passport away and i dont think i have a case file in the court , because i dont live underground and have been summoned to the court for several times in the past months and if there was a file it was easy for them to summon, to arrest or detaine me. Upto now many Iranian writers, journalists and personalities have been banned to leave the country by Islamic Republic officials. An open letter by the family of Mr. Anvar Hossain Panahi. The wife and children of Mr. Anvar Hossain Panahi the political prisoner is sentenced to death, released a letter and asked the free willing people to help them. Everyone knows that our father Mr. Anvar Hossain Panahi is detained for 15 months without any reason. We do not know what has gone to him during these 15 months. We are not going to say what went on us in this 15 months, It is 15 months that we have tolerated the pain of not having the husband and father around us. His absence has become great sorrow for us. It is 15 months that his loneliness and absence brought sorrow for us. We have spent the cold & dark days of 15 months pain without having heard from him. 15 months that we have experience and feel him from behind the prison cell. 15 months that we have been deprived from a very kind husband and father. In this side of the cold and tall wall as tall as the sky, we are waiting for his release and him on the other side of the short, violent and merciless wall seeing us in his dreams.15 months of hot discussion in our house and the neighbors house is about prison, bread winner in the family, not knowing what is going on and hopelessness about his release and freedom.15 months in these kind of childhood, while other children with the same age are heading home and meeting their mother and fathers, but us, with an expecting eyes , depressing face and heart broken getting back home with a hope of meeting our father everyday and the disappointment or not knowing about him is like a poke on our head. We wish no one could ever deprive from the love and affection of their father. The last support person we had was Mr. Ashraf Hossain Panahi (The brother of our father and our uncle), who could follow up and bring the voice of our father to the public and high ranking officials, on the night of August 27,2008, while carrying 5000 signature from the people of our region and was on his way to Tehran to meet the lawyer , he was hit by a car at the side of the road in our village by an unidentified man and died and our only hope like a light turned off. Yes, we are powerless and there are no help. ……. Hoping for the release of all political prisoners. Women in Iran never kept silence and no regime can silence Iranian women when it comes to their human rights! IRAN WATCH CANADA will continue to cover the struggle of Iranian women for their human rights by monitoring their fight back against Islamic Republic policies toward women. 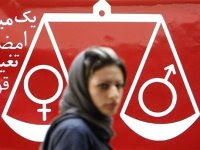 The united activities of women from left in Tehran and Karaj city! the Marxists -socialists individuals , their organizations or political prties are all either moved to abroad or are underground in the Islamic Republic due to reppression, persecution and have no freedom at all. In this two pictures the women belonging to these organizations stage activities on March eight the International Women's Day. They put the women demands in different crowded locations and distributed leaflets from top of buildings. According to report, these activities were welcomed and supported by peoples on the area. Shirin Ebadi in speaking with a German newspaper: We are not going to attend in an undemocratic election! Madam Ebadi told to the newspaper that they are not going to participate in the coming presidential election on June. She has protested to the system of election in Iran and said: "Until the Guardian council is deciding on the competency of candidates , we are not going to participate in the election." In her view the election in Iran is not free, because according to her the the gurdian council is the main obstacle for a free election. "The probelm is to stand on principle. These principle is very important for us. If it is the people to participate in the election, they must have the freedom to choose.In Iran but it isn't this way and the competency of candidates who are not even peoples candidate must be first approved by the gurdian council. For this reason until the gurdian council is looking after the competency of candidates , we won't participate in election." She said: This doesn't mean i'm telling the people not to participate in the election. She added: Some people believe they must participate in election and between "bad and worse" to choose one. She said: In her opinion this idea is correct, but she has chosen not to participate in the election. We are ashamed for all these transgressions and injustices, and we are ashamed for our silence over these deeds. 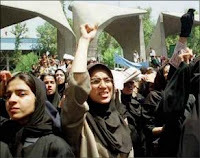 Islamic Republic in Iran by banning all peaceful means of expressing critical views and banning speaking on human rights, is leaving the women who are half of Iranian population to no other choice than pouring into the street one day and like a tsunami revolt against Islam & Islamic republic ! The celebration for International women's Day in Iran was banned by Islamic Republic. The Government and security organizations didn't issue the permission for the organizers of this gathering.Yesterday Tehran City hall supported the government and cancelled the permission for the gathering on March eight the International Women's Day .The lawyers association and the Centre for Human Rights Defenders were helping the women to celeberate this event. Mr. Mohammad Mostafaei the lawyer said: Two weeks ago we got a place for holding this event and applied for permission and received the permission , yesterday when we attended to the location found a note on the window, which was reading; this programe is cancelled because of the lack of permission. We attended to the office of the place and they have told us , for not having permission from governors office the event is cancelled. This lawyer said: "for holding an event, we usually take permission from city hall and not governor's office." Since there was no place to hold the event and since wherever the women went , they were followed by the security agents , even coffee shops and parking lot of artists house ,as a result those women attended were gradually dispersed. Ms. Alieh Eghdamdoost talking through phone line from inside the prison: I’m a woman, a worker and a teacher! She contacted from Nesvan ward in Evin prison. What year did you born and where? You were a teacher one day and you were teaching in high school , but you were expelled from Ministry of Education , is this right? What subjects were you teaching? Where were you teaching? Was it in your birth place or....? For a while in the city of Fuman, my home town and also for sometimes in district number 10- Ministry of Education in Tehran and another time i taught in “Hadaf” girl high school , this was when madam Melina Malkumian was the owner, at the time i was teaching sociology. What did you study while in university? I have received Bachelor of Science in history from Tehran University. I could because of my grade enroll in medicine. Because at that time my IQ and talent grade was 99.2% and I was top student in class. But because i have no tolerance looking at dead bodies and basically I'm soft hearted , I decided not to get in medical studies. What year did you finished your study from university? I think it was 1974. But later i continued my education and in 1997 i finished my master in industrial management (production). We were seven sisters and three brothers. But now we are four sisters and one brother. The rest have past away and I’m the youngest in the family, for this reason my sisters and brother all are in higher age and are very old. Since when you become sensitive with women’s issues? The women issues aren’t separate from Iranian people’s issues, but in laws, women are really being discriminated. Since I was a child and teen by reading the works of “ John Steinbeck” I become familiar with dictions such as inequality , poverty and discrimination and that’s why always poverty , injustice and discrimination was very important and sensitive issues for me. Since childhood the existence of inequality was bothering me and it was very bitter. While I was getting older I could see women like men are working but because of the existence of discrimination laws over our society, women were suffering more from inequality and it was effecting on their lives. Did you ever think that there might be clashes in “ Hafte Tir “ square gathering and you may be arrested? See, It wasn’t problem for me, because it was all about the rights of women and I had six years imprisonment in the past. Alieh , on what issues in your case file do you protest? I remember in investigation process, they have inserted two blue color placards in my court file and they were saying they took those placards from me, while I never had any placards , that means, I participated in that gathering without placards. In the court later on, I saw those placards weren’t blue and instead there was the white one. I announce here that, I was protesting to legal discriminations (which was in fact written on those placards), that’s why I joined the gathering, but specifically these placards that they have inserted in my case file, wasn’t in my hand and my protest is that, according to law , they shouldn’t add or remove anything in my file, and this in my opinion is the violation of law. At the same time , I reject any charges against me, because according to article 27 of constitution, that gathering and every gathering which dealt with the rights of women, teachers and workers , I have every right to participate, because , first of all I’m woman, and then I was a teacher and at a time representative of teachers and also in a period I worked in Mazda company. Therefore, I’m a woman, a teacher and a worker. So, according to law I can participate in those gathering for my union rights and I don’t find it violating the law . UN human rights council must send a delegate to investigate Islamic Republic prisoners in Rejaei Shahr and Evin prisons ! Death of another political prisoner in prison! The death of Mr. Amir Hossain Heshmat Saran was confirmed by his family. 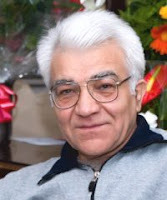 Mr. Heshmat Saran who was in his 5th year out of 16 years imprisonment , because of brain hemorrhage was transfered to "Rejaei Shahr" hospital and this morning passed away. During last two years two other prisoners in same or other circumstances died while in prison and none of either judiciary or prison official respond to this situation. Mr. Amir Saran was arrested on 2003 for allegedly forming a group known as " National united front " and was sentenced by Karaj city court of revolution to eight years imprisonment. Earlier he was also sentenced by another court to eight years for his participation to a protest gathering in front of Hotel Laleh in Tehran , which collectively become 16 years imprisonment. During all this five years, this political prisoner had only one leave of absence from prison which ended by agents arresting him at his home and transferring him to prison. At that time he said: "Because he is not guilty , he does not wish to return to prison." Three medical students of Sahand University in Tabriz city were banned from university because of their belief in Bahai religion! According to news on March three , three medical students of Sahand University in Tabriz city were banned to enrol in next term . Sina Dana, Sama Noorani and Faraz Vazirzadeh are the three banned Bahai students. The president of university upto now decided not to respond to these students questions. It is needed to say that expulsion, deprivation of Bahai students from continuing their education in Iran has a long history. IRAN WATCH CANADA as always condemn discriminatory policy of Islamic Republic against Iranian Bahai's and all other religions. This blog focuses on Iranian politics, with a special emphasis on human rights. It includes videos and photos from Iran, as well as links to various websites that promote human rights and democracy in Iran. Khatami Mania is dedicated to the former president of Iran. It is a non-profit, unofficial, and personal blog that includes news and reports related to Khatami. Golrokh is an Iranian reformist and blogger based in Iran. Her blog is fairly new, yet full of creative, artistic, and poetic entries about current affairs. Tehran BureauTehran Bureau is a source for analytical news coverage of Iranian politics. In addition to its personalized news coverage, this blog links articles from various news sources including the Associated Press. Iran Watch Canada Iran Watch Canada monitors daily news about media, journalists, and human rights. The author of this blog, Morteza Abdolalian, is based in Ontario, Canada. Is This Ta’arof? This is a blog about Iran, Syria and the Middle East, politics, Persian and Arabic poetry, literature and culture, internationalism, international solidarity, and other tenuously related subjects. This is the official blog of the National Iranian American Council. It provides insights, political analyses, and news for policymakers and Iranian-Americans alike. “News from Iran” posts daily media content from Iran. The mission of the site is to provide objective media coverage originating from Iranian sources. Thought TherapyThis Iranian American’s blog focuses on social issues, spirituality, politics, and more. Iranian Freedom seeks to serve as a conduit for Iranian dissidents inside and outside Iran and from across the political spectrum. Co-authored by Amir Farshad Ebrahimi, a freelance journalist born in Tehran, and online journalist Carolin Pubinson, this blog covers Iranian politics, pop culture, art, and human rights. Pictures from Iran and Israel Too Pictures from Iran and Israel Too is a blog that provides visual information to the Iranian and Israeli populations with the hopes of eliminating some of the misunderstandings that exist between two countries. This blog provides extremely well-written and insightful commentary on current Iranian politics and foreign affairs. Hosted by Cyrus Safdari, Iran Affairs is a foreign-affairs focused blog specializing in Iranian politics, economics, and critique of the current U.S administration. This frequently updated blog is a comprehensive source on Iran-focused political, social, and human rights events and news. Ardeshir DolatThe focus of this blog is discussion of political, economic and cultural events in Iran within the context of secular, liberal democracy. Ali Mostofi of Berkshire, United Kingdom, posts interesting articles daily revolving around Iranian news, culture, and politics. In the blog, he discusses his frustrations with both the Iranian government and Western media’s misrepresentation of the Iranian people. For a democratic secular Iran. For peace and prosperity in the Middle East.Azarmehr is an active pro-democracy activist based in London, and blogs on his political beliefs which include democracy, secularism, nationalism, and meritocracy. Another Irani Online Known simply as Niki, this new-to-Washington, DC, Persian blogger speaks her mind on how Iran is perceived abroad. Recent topics include blogging, activism, public opinion polls, and the news. This well-organized blog by self-proclaimed journalist and UN secretary general-hopeful Kourosh Ziabari ventures into art, religion, politics, and sports, providing brief educational profiles on Iranian heavyweights, as well as political analysis and interviews. Jadi started her English blog in May 2006 when her Persian one was blocked in Iran. The Tehran native blogs are about freedom of expression, censorship, and internet filtering, but ventures into politics and the economy on occasion. Subtitled “thoughts on Iranian politics and culture,” Mina’s most recent blog posts switch between telling stories about the various literature she comes across and addressing the Islamic Republic’s leaders—using beautiful prose throughout. This is a group blog edited by Nema Milaninia, the executive director of the Tehran-based publication, the International Studies Journal. His team of contributors include four Iranian-American students and recent graduates. Their posts on politics, activism, the media, and social issues are well written and consistently raise interesting questions. Mehrangiz Kar is an Iranian women’s and human rights activist, lawyer, and author. Her accolades include recognition as a Radcliffe Fellow at Harvard University’s Carr Center for Human Rights Policy at the Kennedy School of Government, a recipient of the National Endowment for Democracy’s Democracy award, and a Scholar at Risk for promoting academic freedom and defending scholars’ human rights. Written by Mohammad Ali Abtahi, former President Mohammad Khatami’s vice president, this blog shows a unique insider perspective to the Iranian government—with some amazing photos to boot. Narratives of Suffering This blog is written by "Hydra," and comments on world news, society, philosophy, and poetry--often employing satire along the way. A self-proclaimed casual observer of Iranian culture, history, and politics, “Lotf Ali” consistently posts very well-written and researched prose. Definitely worth checking out. Under Underground At 23, Yasser recently graduated from Azad University with a degree in microbiology and his blog has already been blocked by his ISP. He writes a combination of his personal experiences and his opinions in response to various Iranian issues and foreign movies. Uskowi on Iran In his blog, Nader Uskowi writes from an editorial and reporting perspective about nuclear and political issues in Iran today. This blog contains straightforward news and analysis that is especially useful for updates on Iran’s security situation if you don’t have time to wade through too much news. The Middle East Interfaith Blogger Network is a forum for open dialogue that connects people across borders to the range of religions represented in the Middle East. This Iran-focused blog is comprised of a collection of political and social news from Iran and includes updates on the human rights violations in Iran. This blog contains the daily thoughts of an Iranian woman and her view on world affairs and issues concerning Iran. Pedestrian consists of the blogger’s thought-provoking ramblings about life in Iran, and always includes photos and images with each post. This blog is devoted to news, analysis, and resources relating to Iran’s nuclear program and US-Iran relations. The Fellowship of Reconciliation is an interfaith organization that promotes active nonviolence as a means to replace violence, war, racism, and economic injustice. This blog highlights economic issues faced by Iranians and discusses Iran and US-Iran relations. This blog is devoted to building an effective global campaign for peace and dialogue between Iran and the international community. Today I witnessed the most brutal, inhumane, immoral, and malicious image in my life with my own eyes for which I am prepared to testify in any court even it costs my life. Today I saw with my own eyes that one of the guard officers by the name of Mohsen Khaki brought a large blond prisoner who had shaved his beard to the protection centre of the prison. Prisoner’s hands and legs were shaking so badly. I was hearing his solicitation and lamentation. Since I had to be in the protection centre, I, along with two other prisoners was able to witness this incident. Supposedly, guards wanted three of us to see the whole incident and learn lesson from it. First, Mr. Kermani, head of the protection centre started beating up the prisoner with a nightstick. With a plastic nightstick in each one’s hand, four guards along with Mohsen Khaki started beating up the prisoner. The prisoner was soliciting and crying. Apparently his crime was involvement in a small scale drug dealing issue. Regardless of his crime, I do not believe that he deserved that kind of terrible torture. While he was receiving punches and kicks, the young prisoner was nailed down. He was screaming, soliciting, and lamenting. That much torture did not satisfy Kermani, head of the protection centre who was extremely furious. He rushed to another room and brought two electrical nightsticks and asked soldiers to stay aside. He gave the second nightstick to Mohsen Khaki. They both started beating up the young prisoner. Prisoner was crying, holding Mohsen Khaki and Kermani’s feet, and begging for mercy. Due to excessive beating, he lost his control. He was crying and begging continuously. At the end, Kermani forced him to lick his shoes. This incident took a long time. Warning for those Iranian opposition (dissidents) travelling to Syria! Warning for members of Peoples Mojahedin of Iran living in Iraq. According to news Mr. Abdollah Mansori a human rights activist from Khuzestan province and a defender of the rights of Iranian -Arab of Khuzestan who had double citizenship of Iran - Netherland was arrested in Syria and deported to Iran! According to a report on February 24 ,2009 from "Netherland Radio International" Mr. Mansori travelled to Syria for visit but was arrested and transferred to Iranian officials. This arrest happened with the request of Islamic Republic officials. Mr. Mansori was travelling with his Netherland passport and there was no political agenda in his travel. Ministry of Foreign Affairs of Netherland is currently looking into the case and Islamic Republic does not allow Netherland lawyers to defend one of its citizens. The Islamic Republic does not recognize Mr. Mansori’s passport and believe that he is an Iranian citizen. Mr. Mansori was sentenced by Islamic Republic judiciary to 30 years imprisonment. Rasul Mazreeh , Taher Mazreeh, Jamal Abdavi, Musa Savari and three students namely: Ahmad abduljalber Abit, Jamal Abidi and Isa Musavi. Three of these people have been released but the rest are still in prison. The Iran-Arab people of Khuzestan are angry from Syrian regime for these arrests and transferring them to Islamic Republic officials. 1700 people, 70 groups and campaign organizers and website demanded for the freedom of Alieh Eghdamdoost ! March 8 the International Women's Day is coming. In Iran the women activists in women movement has to make decision either to get out on that day and have a peaceful rally and go to jail or stay at home and avoid the arrest and detention. When it was about women human rights Alieh was always the first one in the rally. Alieh is a women who sacrificed her life for her belief in justice and now she has to spend three years of her life alone in Evin prison. Alieh is one of the participant in peaceful rally on June 12, 2006. She was sentenced in preliminary court to three years and four months imprisonment and 20 lashes. The appeal court has approved her three years imprisonment. 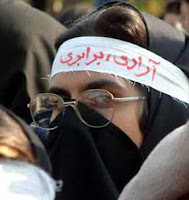 On Sunday January 31,2008 she was transfered from her hometown Fuman to Evin prison in Tehran . She didn't have the chance to say goodbye to any of her friends.Alieh Eghdamdoost is the first women rights activist who goes to jail with a definit sentence. Ahmadinejad: Do i burn it the wrong way , that you wan a burn yourself ? Iranian society has entered into new and dangerous stage! Recently the " Centre for Human Rights Defenders " warned that based on specialists there are more than 10- 15 millions Iranian living below the poverty line in a rich country like Iran. Economic crisis is growing bigger in a country like Iran where its income /budget depends on oil revenue. 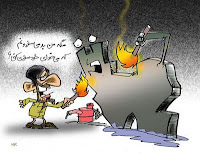 factory closure in recent months has increased and in one example the closure of a cooking oil factory ( Mojtameh Kesht o Sanat- north of Iran )1200 workers lost their job. It has been for months that the workers of " Haft Tapeh" in south of Iran continuously protesting against the policy of Islamic Republic for not responding to their demands. The inflation in Iran has reached to 26% . Mr. Hossain Raghfar an expert in economic have told repoter that , based on information from Iran Statistic Centre which does not have much quality, the poverty line of income is about 780 - 800 thousands Tuman ( close to $800 ). Again, ILNA has reported that, the general secretary for "ending poverty" a division in Ministry of Welfare has announced : "09 Millions needy will receive food stamps ." And again , in recent weeks many Iranian for different reasons but mostly because of poverty and losing their job put themselves on fire and burned themselves to death in public places. And for many many other reasons , Iranian society has entered into new stage. A stage which might burn the whole Iran with Islamic Republic all together. Iranian -American freelance journalist Ms. Roxana Saberi is arrested and detained since January 31st, 2009. Her father Mr. Reza Saberi who lives in north Dakuta state in US, in speaking with American network Television Fox news said: Based on a telephone conversation i had with my daughter on February 10,2009 she was arrested on January 31st and since then she is in prison.She said she might have been arrested because of buying wine from a store and the store owner might have reported her to police. Mr. Saberi beleives she might have been arrested for different reason. Roxana is 31 years old and finished her education in journalism and have worked as freelance journalist with American and English media and wrote reports about Iran for them from Tehran. Establish Ministry of Human Rights in Iran! You must form a "Ministry of Human Rights" ! On the coming of 10th Iran presidential election, the "Centre for Human Rights Defenders " in a statement to presidential candidate, requested the candidate to prepare an under-secretary office to form a " Ministry of Human Rights".